Today’s Spotlight prize in Bentley’s Favorite Things giveaway is an autographed copy of BOTH books in The Returns series. If you enjoy the antics of Bentley and Pierre here, you will LOVE their characters in my books. 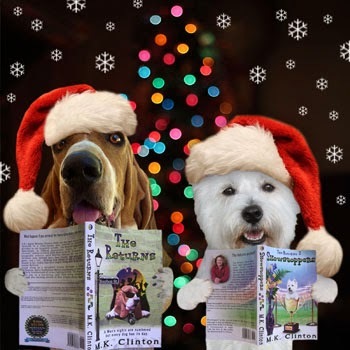 Are you looking for a fun gift to give the dog loving bookworm on your Christmas list? The Returns and The Returns 2~Showstoppers are available in paperback. Don’t take my word for it, my reviews for The Returns are here and for Showstoppers, click here. **Psst, Be sure to stop by this Saturday on my one-year blogiversary for a very special thank you! Click here to enter for your chance to win. This post is part of the BlogPaws' weekly Wordless Wednesday. You can visit other blogs with photos and few words by clicking on their images below. If you are interested in learning more about the BlogPaws community, click here. Pierre has no regrets! :) that's my sweet baby boy!!! I love and miss y'all so so much. I like playin in da leaves too! Crunchy leafs is sooo much funs especially bouncing in to the pile the peeps have just raked up ! LOL we so know that look. Have a wonderful Wednesday. Pierre must be a lot like our Tucker. We call him "Velcro Dog" because everything sticks to his fur. Our leaves are now covered with dusty snow that is about to accumulate A LOT! BOL! Leaves? Not here! Snow is what we have!!! Wooo woooo!!!! I LOVE your returns series! Such an entertaining read!! Pierre looks so cute with those leaves! Oh Pierre is like me...everything sticks to our furs! Happy WW! Leaves in the moustache LOL. Early congratulations to you on your one year blogiversary. Be back on Saturday! The joys of dogs with long fur! Sheba often comes in with whole leaves stuck to her in the fall! 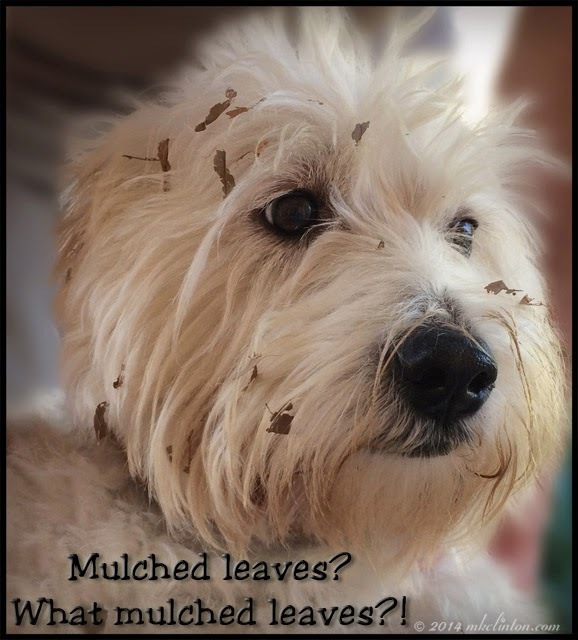 Hummmmm...are our leaves are in the front...all I every pick up is Winter Dormant grass....an I haul that in the house by the dump truck...Barharhar, iy takes Mon a while to get it all off of ME.........and that nut Bites, nothing sticks to him! Great photo of Pierre! Ava and Veruca don't have that problem. But Veruca does manage to find her fair share of burdocks to bring home in her fur. I hope Pierre doesn't mind getting the leaves brushed out. Pierre, just tell them it's the wind-blown look! what a great picture! I bet those leaves are hard to get out of his hair when they break into a million small pieces. MOL! Pierre, did you do a faceplant into the leaves? ?